The Flashman Papers is a series of humorous novels and short stories about a cowardly British soldier who is placed in a series of real historical incidents at the end of the 19th century. For the last 5 years, London based builder Workshysteve has been delighting us with a series of beautiful little LEGO vignettes depicting the most poignant moments from Flashman’s life. Here is the latest, largest and sadly last of these creations, in which an elderly Flashman prepares to write his memoirs, surrounded by trinkets he acquired during his adventures. 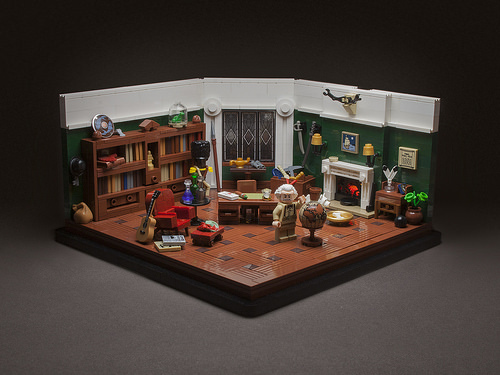 According to the builder, this scene contains 25 hidden LEGO pieces that have only appeared once in each of the 25 other creations in this series. I hope you have fun trying to spot them all. But be warned: There are also quite a few red herrings too, where an item in this picture appears in more than one of the other scenes. Check out the whole series and try to find them for yourself.